Being a first-person shooter, Doom is experienced through the eyes of the main character. The objective of each level is simply to locate the exit room that leads to the next area (usually labeled with an inviting red EXIT sign or a special kind of door), while surviving all hazards on the way. Among the obstacles are monsters, pits of radioactive slime, ceilings that come down and crush the player, and locked doors for which a keycard, Skeleton key, or remote switch need to be located. The levels are sometimes labyrinthine (the automap can be used as an aid for navigation) and feature plenty of hidden secret areas that hold power-ups as a reward for players who explore. Doom is notable for the weapons arsenal available to the player, which became prototypical for first-person shooters. The player starts armed only with a pistol, and brass-knuckled fists in case the ammunition runs out, but larger weapons can be picked up: these are a chainsaw, a shotgun, a chaingun, a rocket launcher, a plasma rifle, and finally the immensely powerful BFG 9000. There is a wide array of power-ups, such as a backpack that increases the player's ammunition-carrying capacity, armor, first aid kits to restore health, the berserk pack (a black first aid box that puts the character into berserk mode, allowing them to deal out rocket launcher-level damage with their fists and potentially splattering former humans and imps), and supernatural blue orbs (called Soul Spheres) that boost the player's health percentage beyond 100%, up to a maximum of 200%. Episode III: Inferno is set in Hell. The main character has just fired the shotgun at a group of Imps and is cycling it. He is injured and has only seven shells left.The enemy monsters in Doom make up the central gameplay element. The player faces them in large numbers, on the higher of the game's five difficulty levels often encountering a dozen or more in the same room. There are 10 types of monsters (Doom II doubles this figure), including possessed humans as well as demons of different strength, ranging from weak but ubiquitous imps and red, floating cacodemons, to the bosses which survive multiple strikes even from the player's strongest weapons. The monsters have very simple behavior, consisting of either walking toward the player or attacking by throwing fireballs, biting, and scratching (though they can also fight each other). 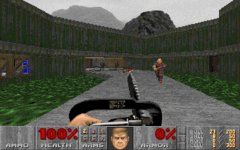 Many versions of Doom (and its sequels) include secret levels which are accessed by the player discovering alternate exits, often hidden behind secret doors or in difficult-to-reach areas. In some versions of Doom II two of these secret levels incorporate level design and characters from Doom's precursor, Wolfenstein 3D. Aside from the single-player game mode, Doom features two multiplayer modes playable over a network: "co-operative", in which two to four players team up against the legions of Hell, and "deathmatch", in which two to four players fight each other.